Welcome back to Dragon’s Demize, where we’re looking at another one of our favorites for an updated review. 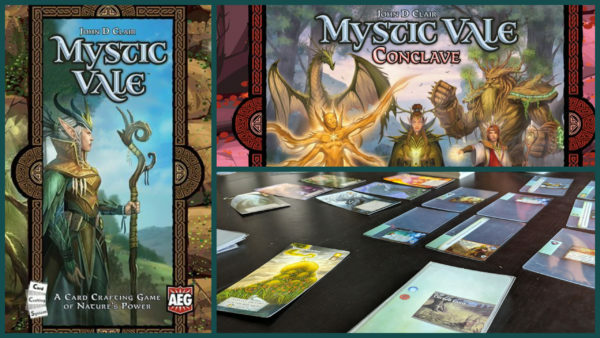 Last time we discussed the card-building wonder of Mystic Vale, we weren’t able to talk about the expansions because they didn’t exist! Today’s episode looks at each of the five expansions and examines how the themes and mechanics they’ve brought to the game have shaken things up. Check out the episode for a full review, including re-issued ratings, and then head over to this week’s Facebook post and tag a friend who loves deck builders! Jakub also walks us through his first impressions of Betrayal Legacy on What We’ve Been Playing. It sounds like a fantastic game that not only solves some of the issues that plagued the original Betrayal, but also takes full advantage of the legacy style. I can’t wait to bring it to the Dragon’s Demize table. Thank you as always to O Abnormal and Agata Poniatowski for the artwork and Strangelette for the music. If you enjoyed this episode and would like to support Dragon’s Demize, please consider joining us on Patreon. You can also follow us on Twitter, join us on Discord, or see what we’re playing on Instagram. Finally, all of our streams, vlogs, and other video content on live on our Youtube channel, or you can catch us live every Wednesday on Twitch.